Mah Sing Group Bhd is launching its largest project, a whopping RM1.35bil mixed development called Southbay Penang on a 35ha freehold site in Batu Maung soon. Group chief operating officer Ng Heng Phai said the plans for the first and second phases of the project had been submitted to the local authorities. “We plan to launch the first phase in the first half of 2008, as soon as we get the green light. The second and third phases will be launched in late 2008,” he told StarBiz. Southbay Penang, comprising 376 units of landed residential properties and an integrated commercial hub, is scheduled for completion within seven years. The commercial component will make up 70% of the project. And of that, about 50% will be serviced condominiums and the rest retail and fine-dining outlets. Ng said the group would unveil the first phase of Southbay Penang this weekend. ”So far, we have received over 2,000 registrations for the preview,” he said, adding that Southbay Penang was the group’s largest project to date. Mah Sing’s RM858mil Aman Perdana in the Klang Valley and the RM530mil Austin Perdana in Johor Baru are the group’s two other projects with sizeable gross sales value. Both projects are currently under construction. The two township projects have landed residential and commercial components. The first phase of Southbay Penang comprises 288 units of three-storey link homes with built-up areas of over 3,000 sq ft.
“The salient features are the six bedrooms and six bathrooms in each unit, high ceiling and a garden located on the second floor. 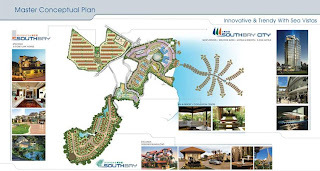 There will also be clubhouse and a recreational park,” Ng said. He said the second phase would comprise 88 bungalows with built-up areas of 3,800 to 8,000 sq ft.
“High-level security will be provided for in the first and second phases. We will also have patrolling guards and intrusion devices installed in the individual properties,” he said, adding that the landed residential properties were also targeted at overseas buyers. The three-storey link homes are tentatively priced from RM755,000 onwards, while the bungalows will cost at least RM2.5mil each. On the integrated commercial hub, Ng said the group would model it after seaside resorts such as the Darling Harbour in Sydney, the Canary Wharf in London, and well-known Mediterranean resorts in Spain. “We are also interested in incorporating certain features of Xin Tian Di, the popular entertainment precinct in Shanghai, into our commercial scheme. “The commercial hub will also have at least two hotels. We hope to finalise and submit the plans for the commercial component for approval before the end of the year,” he said. “The whole development will be integrated via a landscaped boulevard which will be perfect for retail outlets, including alfresco dining and boutiques.